Recipe: Mix the oil, chopped dill, garlic, salt and pepper and dip the shrimp in the marinade. After that wrap the shrimp with the prosciutto slices and secure with a toothpick. If you find the prosciutto salty enough, you may wish to skip the salt for the marinade; In a cast iron pan over medium heat, cook the wrapped shrimp for 3-4 minutes for each side, or alternatively, cook them in a preheated oven for 6-7 minutes. Meanwhile in a medium frying pan sauté all the vegetables for risotto, add the boiled rice, stir well and add the chicken stock. Add more stock if necessary. Cook until the stock absorbs into the rice and fold in the Parmesan cheese. 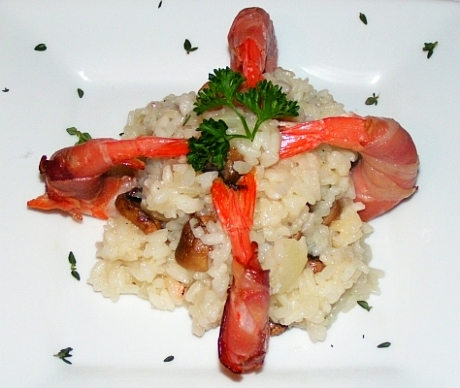 Season the mushroom risotto to taste and serve as seen in the picture. Cooking tip: Originally risotto is to be cooked starting with uncooked rice and gradually cooking it in the same pan with the addition of chicken stock, but this recipe is labor and time consuming, so for this recipe I use boiled and washed rice (not overcooked).